A BOTE re: Seeing A SAM from GEO? TITLE: A BOTE re: Seeing a SAM from GEO? Preface: The shootdown of MH17 has been bothering me a great deal. Within a minute of learning of it last Thursday at lunchtime, I knew pretty much what happened and why. One way I cope with such situations is to make them into a teaching moment, using simple math and physics, relating to ordinary things in peoples lives. I did a lot of that after 9/11, and again after Columbia. Update: On 13 October 2015, the Dutch Safety Board released its final report definitely identifying the SA-11 as the weapon which brought down the plane. In the interest of shedding light, not heat, I did a BOTE (back o the envelope, along the lines of consider a spherical cow) estimate of the visibility from space of the thermal emission of an SA-11 launch. Based on first principles, and not too many SWAGs, the answer is yes. I consulted my ancient desktop manual Illustrated Dictionary of Modern Soviet Weapons (Prentice Hall Press, 1986), and compared it to the table of specs in the wiki to be sure were talking about the same thing. Yes, what the Russkiis call the 9M38 under their GRAU system of military nomenclature aka Buk which means Beech[tree] is what the US DoD/NATO calls the GADFLY/SA-11. A more advanced version of the Buk air defense system is called GRIZZLY or SA-17 by NATO. For the purpose of this analysis, the SA-11 and SA-17 are very similar in mass and length. So GLOW is 700 kg, with a 70 kg warhead (red-colored part in the figure below). Figure 500 kg of propellant (orange-colored part in the figure below), all solid, burning in 15 secs. Allocate 130 kg for everything else, airframe, fins, avionics/fuze/guidance, etc. (Gray-colored parts in the figure below.) No air breathing in this case (although a few Soviet-era SAMs did do that); all of Buks propellant (fuel blended with oxidizer) is onboard. The 9M38 surface-to-air missile utilizes a two-mode solid fuel rocket engine with total burn time of about 15 seconds; the combustion chamber is reinforced by metal. Im guessing the two modes are boost to rapidly accelerate to Mach 3, then sustain at a much lower burn rate just enough to maintain velocity, overcome drag, gain altitude, and make rapid course changes but not accelerate the missile any more. The maximum engagable target speed was 1200 m/s and it [the 9M317 version] can tolerate an acceleration overload of 24G. Well partition the burn into 5 seconds of boost @ 20 gravities (a very hard ride, practically a controlled explosion), which gets the missile to 1000 m/s i.e., Mach 3. This is followed by 10 seconds of sustaining burn @ 0 gee net after MECO. I note the older SA-2 system also had a boost phase of about 5 seconds plus a dozen-and-a-half seconds of sustainment, so thats a reasonable time partition. To keep the math simple, we'll assume a launch straight up. What kind of energy are we talking about in the launch plume, and whats its energy partition? The explosive energy [for TNT] utilized by NIST is 4184 J/g (4.184 MJ/kg). So, excluding the warhead, the initial energy contained in the propellant is 500 [kg] x 1000 [g/kg] x 4184 joules [J/g], or 2 billion joules (2 gigajoules). Figure the burn rate during boost is an order of magnitude greater than the sustaining rate. So well divvy it up thus: 80 kg/sec x 5 seconds of boost plus 10 kg/sec x 10 seconds of sustain, then the propellants gone. Based on SA-2 experience, thats a reasonable assumption. Assuming the missile is launched straight up, then at MECO (main engine cut off)* when 80% of the propellant is burned (1.6 out of the 2 gigajoules is used up), the missiles parameters are: mass* = 300 kg*, speed = 1000 m/sec, altitude = 2500 m*. Energy of position at MECO is m * g * h = 300 x 10 x 2500 = 7.5 megajoules. Energy lost to drag: it is difficult to estimate this term on the back of an envelope for an intelligent layman, but comparing the power during the boost burn rate versus the power during the sustaining burn rate suggests that drag loss is roughly a tenth of the total energy budget until now. So, 160 megajoules. Thats a SWAG. Adding these up gives you about 320 megajoules, which is only 20% of the 1.6 gigajoules of energy in the propellant burned so far. And only half of that, 10%, is in the form of actually useful speed and height. Mostly speed. Rockets are not very efficient**! See the Sankey*** diagram below. So, 10% useful work and the same lost to drag leaves 80% x 1.6 gigajoules = ~1.3 GJ being dissipated to the environment. We know that this energy is being wasted, but how? 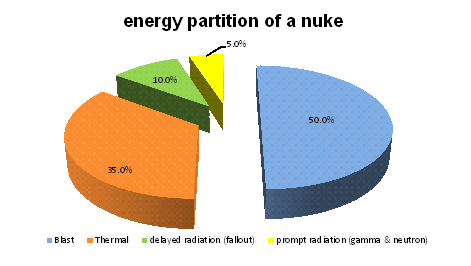 Recall the rule of thumb that the energy partition of a nuclear explosion is typically about one-half mechanical blast, one-third thermal radiation, and one-sixth nuclear radiation (prompt gamma rays and neutrons, plus delayed radiation, i.e., fallout). The ratio between blast and thermal in a nuke is 1.5-to-1. That partition is driven by the extreme temperature of the initial fireball, millions then thousands of degrees. By contrast, the incandescent rocket exhaust from a chemical reaction might be 5000 kelvins, max. So I think its safe to estimate that the partition of wasted energy in a rockets exhaust plume is at least 2:1 mechanical effects (shock/noise/turbulence) relative to thermal effects (mostly radiation). The time scale is so short that I dont think conduction to the surrounding air is a significant heat loss mechanism, and convection (heat loss by swirling fluid) sort of bridges the gap between mechanical and thermal. So lets just say 2:1. See the Sankey diagram above. 2:1 means two-thirds (800+ megajoules) become noise, etc, and one-third of the waste (400+ megajoules) becomes light then heat. Lets assume a steady-state burn over those 5 seconds of rapid boost. Dividing 400 MJ by 5 seconds means the average radiated optical power is ~80 megawatts. The acoustic/mechanical power is double that. All this power is being dumped into a teardrop-shaped volume perhaps a meter or three at its widest by 10 meters or so long. Say 15 square meters projected area from almost any angle. Another SWAG. The visible incandescent part at 5000 kelvins is a lot smaller than the smoky part. The visible part cools off not just by expansion but extremely fast by radiation (proportional to T4). But even the smoky part will radiate in the infrared for a few seconds more. How much longer requires an extremely technical analysis and a lot of assumptions we wont bother with. We could back into an estimate of the color temperature with the given energy, mass flow, and a blackbody curve, but its not worth the trouble. We have enough to proceed to an answer. 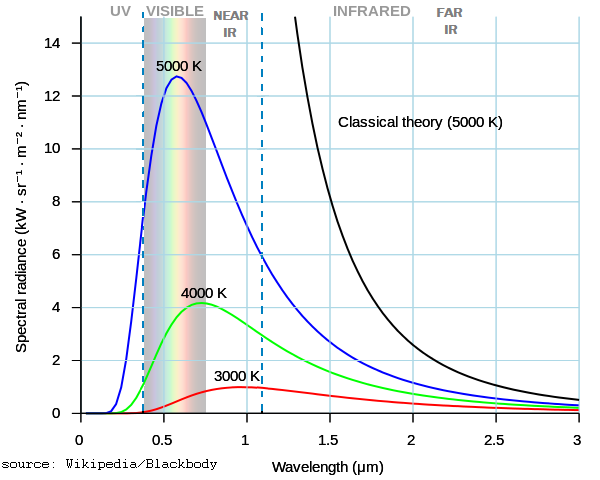 As you can see from this blue curve on this graph, a blackbody radiating at 5000K puts well over half its total emissive power (63% ≈ 1-1/e) counting the area under the curve and within the interval between the two vertical dashed blue lines, 400-nm violet light on the left and 1100-nm near IR on the right. Even a cool 3000K flame (red curve) puts about half its power in the wavelengths that military satellites can see. Shape and aspect ratio are important when trying to see something, but only at short range. A unobstructed rear view would be better than a front view, since the body of the missile will occult some of its own plume, while a side-on view of the long hot plume would be best of all. But Im guessing that aspect ratio would make at most a factor of 2 or 3 difference at modest range, not more. From a long distance away, the exhaust plume is pretty much a point source, so we can assume half the thermal radiation (~40+ MW) goes into a hemisphere aimed down, and the other half (~40+ MW) goes up into space. Long-wave IR from warm surfaces gets trapped pretty effectively by our atmosphere, but pretty hot short-wave near-IR stuff does not (which is why the greenhouse effect works and keeps us alive). If its hot enough, heat goes out as easily as it came in. Before our eye in the sky sees it, at least one-sixth or so of the visible/near-IR radiation gets filtered or absorbed by the air above it, even on a clear day. On a cloudy day, no IR might make it out, so cloud cover is an important factor for detecting light and heat, but not radio. Accounting for this further loss still leaves optical power in the mid-30s of megawatts, of which about 2/3 is stuffed into wavelengths that military birds in space can see. So lets say ~20+ MW of thermal power spreads isotropically out into space from the moving point source under decent viewing conditions. Since the sky was clear enough for the killers to see up to their target, it was clear enough to see down, too. Cuts both ways. So the task becomes to see a 15-square-meter object radiating like a 5000K blackbody at ~20+ MW in the visible and the near-IR for 5 seconds. Say a surface emission intensity of >1 MW per square meter, possibly as much as 2 MW/m2. Well, compare this to the typical surface intensity from our warm Earth radiating at 300K: 250-350 W/m2, summed over all waves, depending when and where you measure from. So from low orbit the SA-11s hot exhaust plume is optically 3,000-8,000 times brighter than Earths warm background disk, i.e. a signal-to-noise ratio of 35-39 decibels. Is a thermal signal with this much contrast visible from deeper in space, say from the old Defense Support Program (DSP) satellites in GEO, which were designed 40+ years ago to detect strategic missile launches during the Cold War? Remember that an optical system like a telescope is a light bucket. That is, it collects, it integrates. This is why stars are visible to our human eyeballs as point sources, even though their actual disks are way too small to make out with such tiny pupils. So a hot spot buried inside a pixel (not to be confused with a hot pixel which is a technical malfunction astrophotographers grapple with) can bleed over and bump up the brightness value of the whole pixel across the detectable threshold even if the hot spot is way smaller than the ostensible resolution of the imaging system. The amount of the bump is straight arithmetic averaging over the area. From close up, what looks like one hot spot emitting X, next to a cold one emitting nothing, will from far off look like a spot twice the area emitting the average of the two, i.e., X/2. Operators of commercial remote sensing satellites (in 800-km LEO) have recently announced the availability of resolution at 30 cm. (It is an open secret that US reconnaissance satellites at one time could achieve about half this figure; perhaps they still can.) Commercial systems have optical elements in the range of 1 meter across; civil scientific birds like Hubble can go more than twice that. Since resolution scales linearly with distance, that means the same imaging bird with the same size optics directly overhead in GEO, 45X further away, should be able to make out a pixel roughly 15 m across (and maybe half that) in visible light. Unfavorable geometry (viewing from off-axis) makes less difference in GEO than it would in LEO, because from a spot in GEO everything is more-or-less the same distance away (within +/- 10%). Now, resolution also scales directly with wavelength, so a 15-m pixel from GEO at 550 nanometers (yellow-green light) becomes a 30-m pixel at 1100 nanometers (near-infrared light). Since the old Cold War systems were looking in the IR, well use the tougher parameter and also assume no-better-than-known-modern civilian technology. The area of a 30-meter-wide pixel is a bit over 700 square meters. Arithmetically blending a 20-MW / 15-sq.meter hot source into that 700 sq.meter area cools down the brightness ratio by a factor of 45 or so. Thus, from GEO, a pixel with an SA-11s hot launch plume blended into it should still be about 60-170X as bright as any neighboring pixel of the warm Earth, i.e. a SNR of 18-22 decibels. Say, 20 dB. 20 dB is a good solid signal. Even 40-year-old Cold War technology would have bagged that shot. If SBIRS (a newer much more capable system with some portions in Molniya orbits that swoop much closer to the ground) happened to be in the right place, then it assuredly saw the missile launch and the destruction of MH17, too. No taking things on faith, absurd press releases or ignorant lame-*ss blogs required; the application of simple logic, math and physics by our own minds tells us what us need to know. Robert Kennedy is president of the Ultimax Group Inc., a corporation distributed across 11 time zones from Moscow to L.A. He speaks enough languages to start bar fights in all of them. Robotics engineer, amateur historian, and jack of all trades, he spent 1994 working for the House Science Committee's Subcommittee on Space as ASME's Congressional Fellow. Robert lives in Oak Ridge, Tennessee, where he resides with his wife, numerous cats, and a whole lot of Detroit iron. 24Jul2014: upload HTML version to Web. 27Jul2014: modify and adapt images, Sankey diagram, and upload. 13Oct2015: Dutch Safety Board releases final report identifying the SA-11 at the weapon which brought down the aircraft. 21Oct2015: corrected location of warhead at top of body, not cone. This site proudly powered and maintained with Figures and technical content of this paper © 1989-2015 by the author, Robert Kennedy. All other material © 1994-2015 by The Ultimax Group, Inc. The entire content (text and images except those sourced as noted) of these pages is copyrighted and may not be distributed, downloaded, modified, reused, re-posted or otherwise used without the express written permission of the authors.